Growing up I loathed porridge. My mom used to make it especially when we were young with semolina and sometimes rice. You can imagine my contorted young face, my eyes rolling as I get nauseated just from the thought and anticipation of what's simmering in the sauce pan on top of the gas stove in our tiny kitchen. My mom was determined to get some cheap and quick nutritious breakfast into our skinny bodies. Spoon feeding us on a busy morning, just moments before we bolt out the door, late, to school. That was kindergarten and first grade. My mom already on kid number five and pregnant again. I got no memories of porridge thereafter. As much as I loathed porridge, I loved the romantic notion of it in Goldilocks and The Three Bears throughout my childhood and into my adulthood. I was the protagonist in the fairy tale floating from one bowl to the next and breaking baby bear's chair, weren't we all?! Years later we bought a house of bricks but that is another fairy tale. Today, not one bowl full since kindergarten and first grade, a sudden craving came over me for porridge. I was hoping my craving would disappear into thin air and dissipate. Sunday came and my curious craving not lost, intensified, and I caved in. Add oats, milk and water into a medium sauce pan and bring to a boil. Reduce to low heat and stir in cardamon. Cook on low, uncovered for up to 10 minutes, depending on consistency desired. Stir in honey immediately after taking off the heat. Pour into bowls while hot, garnish with sectioned oranges and serve. 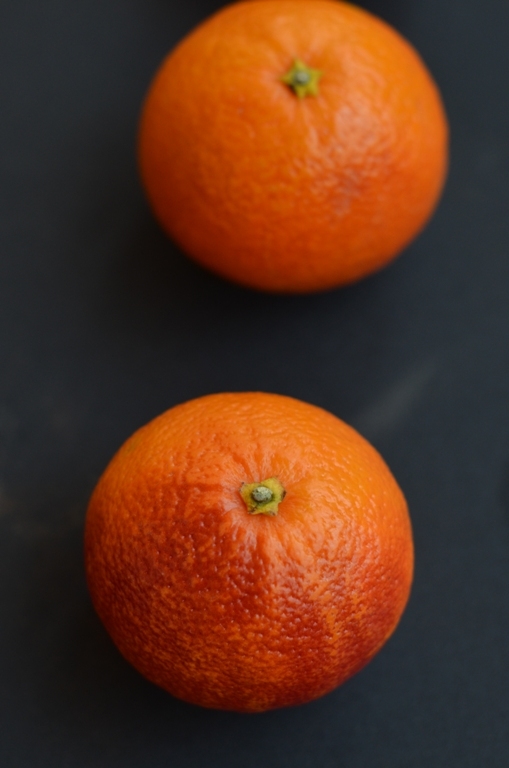 So glad to know you are a fellow cara cara orange lover! Your porridge looks so comforting-too bad you had to wait so long to enjoy it. Love the orange photos!! Lovely and comforting!I must admit oatmeal has been my staple breakfast,the last few months and I love it.Especially the ones with flax and blueberries.Would love to try out your recipe now.Thanks for sharing! Shulie, your photographs are warm, inviting and moving - they do exactly what a image should do, leave me wanting to eat everything you make & photograph! I love porridge, especially with fruit mixed in. Yum, love the combination of cardamon and orange, nice and bright. Can't wait to give this a try! Love this! Visiting from citrus bloghop! So glad I stopped by, lovin' this simple nourishing breakfast. Cardeman, perfectly paired with orange! LOL I used to hate porridge too and even now can't say I like it much. But can eat it. and yes I can imagine your face:) the blood orange sounds fantastic. With some fruit is the only way I can eat a porridge now. 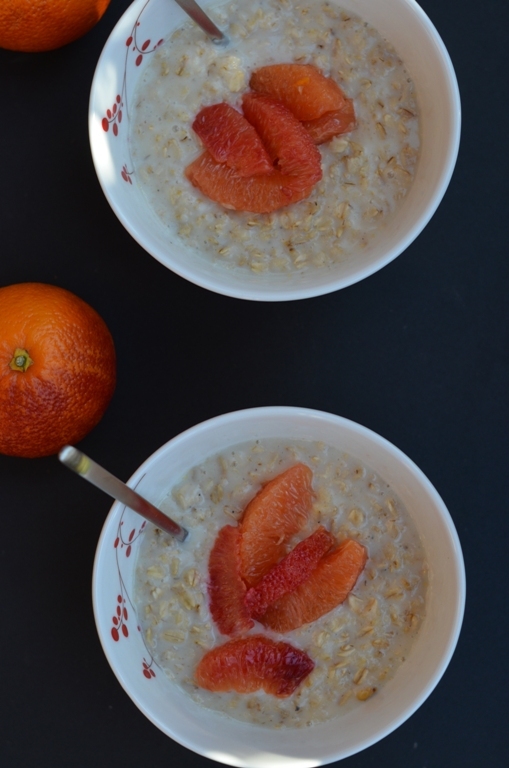 love oatmeal with fruit in it this sounds wonderful too bad I can't get such beautiful oranges where we live only the common ones are available :( but I shall keep looking. Thanks for the sweet comment on my salad. 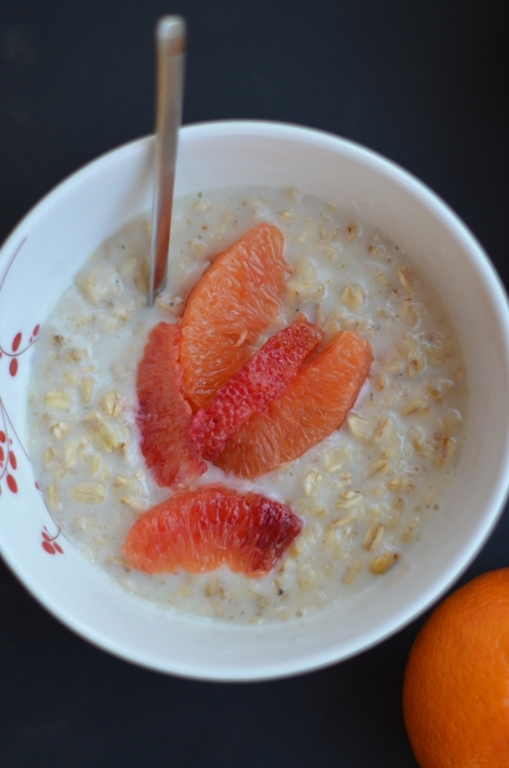 i love this idea of the simple oatmeal all dressed up! and love your pictures Shulie! Oatmeal is so delicious and versatile. I love that cereal. This combo is wonderful! 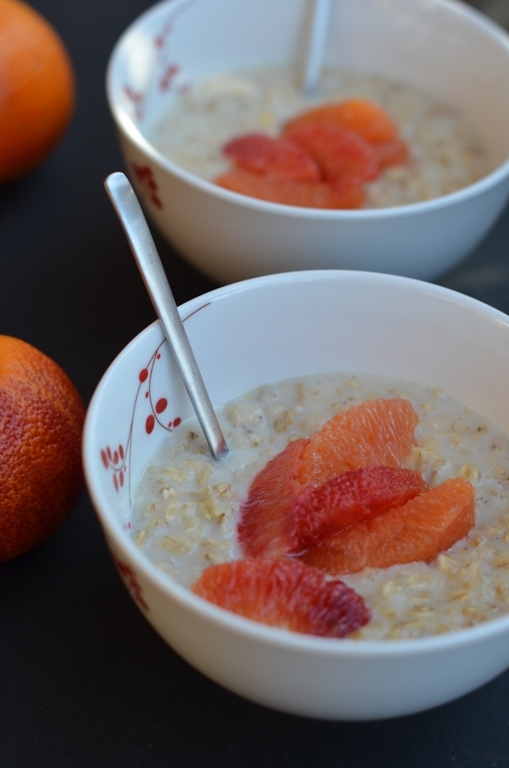 super healthy :) I need this recipe =), since we do not have the blood oranges facility in India. would stick to orange (color& fruit!). Thnx. now that sounds good, I usually hate breakfast, this would be nice. 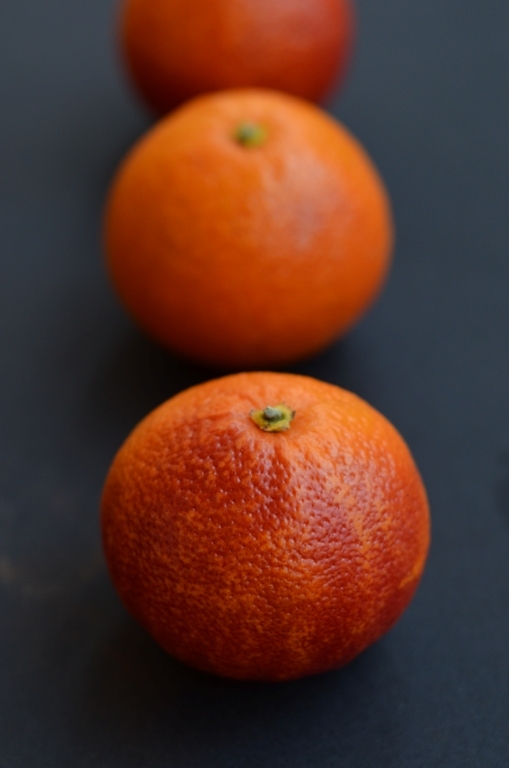 Lovely photos & great, heartwarming recipe & story!Thanks for sharing the citrus-love, Shulie! Glad to cook along with you on this blog-hop! i love the pinkish orange hues of the cara cara orange! and i love oatmeal. delicious clean healthy recipe! i love! Semolina porridge was always a favorite of mine growing up, a really comforting way to start the day. I loved oatmeal growing up and my mom would make a huge pot on Sunday mornings all winter long (2 or 3 months in Florida!) and whenever I woke up and wandered into the kitchen, I would finish off the pot no matter how much was there, no matter if anyone else had had a bowl. Loved it! Your version is really such an elegant version! I love it! I will forever think of Goldilocks when I eat my porrage!! And your adding in cardamon sounds fabulous!! I'm making this tomorrow morning!! Finally in front of the computer and can comment! My face is hurting from smiling...that's just how I imagined you and porridge, what can I say? My head is full of animated characters largely inspired by my FRIENDS! As usual, I loved the back story and photography! Thank you for the sweet mention. I had no idea I'd end up here again! I have to look for those cara CAra oranges. I haven't seen any around here, just blood ones. First off, I love your nickname Goldilocks, so fun! I have never had porridge, but honestly you make it look, and sound AMAZING! Maybe because you added my favorite, cardamom, YUM:-) I still have not tried a blood orange, I know weird, but I will try one soon, promise:-) Hugs!! !